Ikot Ekpene, popularly known as the raffia city and as well the first Local Government in West Africa. In recent years entertainers in the city have tried to step up their game by coming up with various projects aimed at taking the entertainment industry to the next level by promoting raw talents. It is often said that “A tree cannot form a forest” as such, spirited entertainers in Ikot Ekpene ranging from Bloggers, Djs, Music Artistes, Comedians, Producers, and Event Managers have teamed up to for a forum “RAFFIA CITY ENTERTAINERS”. On their first official general meeting held on the 18th May, 2018 at Dj Kool Bar, 4 Grooves road, off Control Post Junction Ikot Ekpene, Akwa Ibom State, the executives spent time to highlight the aims and objectives of the group and the vision behind it. They also spent time discussing the way forward for Ikot Ekpene Entertainment Industry in which they concluded is unity. 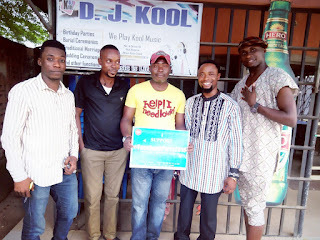 The Special Assistant to Ikot Ekpene Council Chairman on Entertainment Matters, Ndifreke Obot popularly called Nazi stresses the need for the group to be active in organizing entertainment activities that will not just develop and promote raw talent but also promote the Dakkada philosophy of Governor of Udom Emmanuel. He also added that the Chairman can only support Raffia City Entertainers if they believe in theirselves by always thinking of how to make the city a destination city. Following his appointment as the Secretary General, Xbeef is expected to deals with correspondence, admits new members, and organizes official meetings and events, while also serving as a publicity secretary as he will also be responsible for writing press release to be made available to the public and the members of the press (News Men) when necessary. 1. The group (Raffia City Entertainers) is created for all entertainers in Ikot Ekpene (Raffia City) and its environs to come together in unity and love to help encourage and support themselves with ideas and whatever form of contribution. 2. To help boost and take the entertainment industry in to the next level with the consent of the Executive Chairman of Ikot Ekpene Local Government Area (Hon. Unyime Etim) in line with one of his agenda for the youths which is youth Development and Empowerment. 3. To promote Brands (Certified Bloggers, Social Media Influencers, Music Artistes, Comedians, Club/Radio Djs, Music Producers and Event Managers) within Ikot Ekpene while working in one voice and one spirit to achieve MDGs goals in the entertainment industry. 4. The Executive Chairman of Ikot Ekpene Local Government Area (Hon. Unyime Etim) is ready to support young talents in this sector; so the group is set up so it will be wise for all (entertainers) to embrace his kind gesture while supporting his vision for Ikot Ekpene youths. All entertainers are urged to give them the necessary support needed to pilot the affairs of the group as they seek partnership and sponsors, from both the Local and the State Government.